With the upcoming Come Around Sundown, Caleb and Nathan Followill and co are ready to take on the world...again! Kings Of Leon's new album Come Around Sundown will be released in the UK on 18 October and 19 October in North America, it was announced today (4 August). The follow-up to the Nashville quartet's hugely successful Only By The Night, which sold over six million copies worldwide and won four Grammy Awards, Come Around Sundown was recorded in New York City at Avatar Studios and was produced by Angelo Petraglia and Jacquire King (the same duo who helmed Only By The Night). Earlier this year, KOL drummer Nathan Followill said that the album marked "the first time we ever recorded in New York City, and we thought we'd come out with a darker record because we'd done all our records in either Nashville or Los Angeles where it's a little more chilled out. [But] I'll be damned if we didn't go in there and make a fun record! "It's got songs that are beach-y and songs that are a little more like our [2003 debut album] Youth & Young Manhood days. We're super excited. It will be interesting to see how well received it is." The band has been previewing new songs during their summer tour, which has included headline slots at festivals in the UK and US. 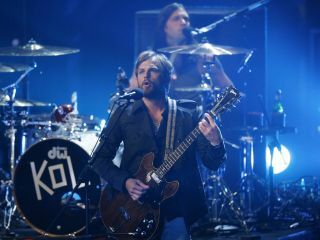 Keep it locked on MusicRadar for more Kings Of Leon news as it develops.